I just have to introduce you to one of my all-time favorite companies as a special education teacher. No, it's not anything curriculum or school supplies...it's clothing!! Maybe you've seen this symbol before. If not, you're pretty much going to fall in love the second you look at it (I know I did!) Ready?? Here it is! It's the wheelchair heart symbol - from the 3ELove site, described as "a symbol of society accepting people with disabilities as equals and a symbol that people with disabilities accept their challenges and even embrace them. By replacing the wheel with a heart, the stigma of the wheelchair is also removed, and it can be a symbol for people with any disability or impairment. It represents the person, not society's perception of him or her." Read more about the symbol here. Are you not in love yet? As soon as I was introduced with the company, I got an order together with over 40 people in my department and now we all proudly wear our 3ELove attire. Stevie, the CEO of this company, is awesome and I worked with him to put our order together. I had people getting all sorts of different things and he did awesome getting everything together so smoothly and quickly too! Everything came packaged individually for each person who ordered!! It was awesome. And in case you were wondering, no, this is not a sponsored post, Stevie doesn't even know I'm writing this :) I just love the company and the idea behind it all, so I want to help spread the word! What might I get next time? The love hooded zip-up in asphalt! Sigh. It's beautiful!! And right now they are having a SALE since this past Sunday, the 20th was the national day of acceptance. The sale runs through the 27th of this month! Many shirts just $12!!!!!! I hope I introduced you to this awesome company if you hadn't heard of them before. Let me know if you pick anything out - so many fun things. Now, onto the "What Did They Say?" 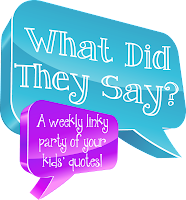 linky party - click the button below to read more and to join in the fun! I'm stealing borrowing sharing one of the cutest stories I have ever heard. One of my college friends is also a special educator and she got engaged over Christmas break. (YAY! And I just have to share, my husband and I totally set up them. They are so perfect for each other.) Anyway, she is telling her students this, and one of her kids asked, "So, who bowed down to you?" SOOO cute! First off, those shirts are hands down the best thing I've ever seen! I'm going to forward them to so many people!!!!! Also, I love the story you posted! So precious! Thanks for linking up! Love the shirts & your your story.